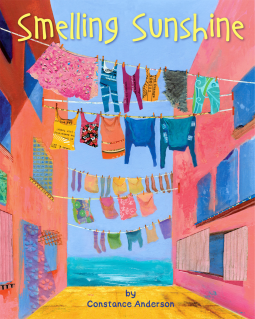 Today’s book review is for Smelling Sunshine, by Constance Anderson, published by Star Bright Books. I received an electronic copy of this book from the publisher, through NetGalley, in exchange for an honest review. Smelling Sunshine celebrates the ritual of laundry day. All over the world, families wash their clothes and hang them outside to dry on the line. The experience can turn a chore into something fun. It’s a chance to celebrate being outside and bonding with one’s family. I liked the concept behind the book. Hanging up laundry to dry on the line can be an enjoyable experience. It gives you a chance to be outside, connecting with the world. Anderson touched on these feelings in her book. Unfortunately the prose fell flat for me. To start with, the first 13 pages are just one clumsy, run-on sentence. By the time I reached the end of the sentence, I couldn’t remember how it had begun. After that, there are a series of awkward sentences–including one that wasn’t even grammatically correct. The only section that actually worked for me in terms of the writing was the very end. On the other hand, I did like the illustrations. They are richly textured, full of beautiful patterns and vibrant colors. Anderson appears to use a combination of collage and painting to produce her images. It’s a nice technique. By blending the two mediums, she is able to create greater depth than collage alone could–while maintaining the fun play of pattern and texture. I also appreciate that she depicts a wide variety of cultures and traditions in the book, so that children can see that hanging laundry is something we have in common with people around the globe. If you’re looking for a book about laundry that depicts positive parent and child relationships, then this would be an appropriate choice. However, due to my dislike of the prose, I can only give it 2 out of 5 stars. Like I said, the concept was lovely, but the writing didn’t deliver.